Why did it take people so long to come up with this brilliant gadget!? 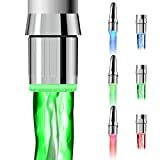 The DLAND RC-F03 Multicolor LED Faucet Attachment screws onto any standard faucet you might have in your kitchen or your bathroom. Water flows straight through it with no pressure loss, and it shines one of three colors as water passes through it. If the water is cold, it glows blue. If it’s hot, it glows red. And if it’s just right, it glows green. Seriously, it’ll be the best $10 you’ve ever spent.